At the beginning of the breeding season and following several courtship displays, the nest-site is selected by the pair, or one of the members of the pair, and the nest is built within this area. 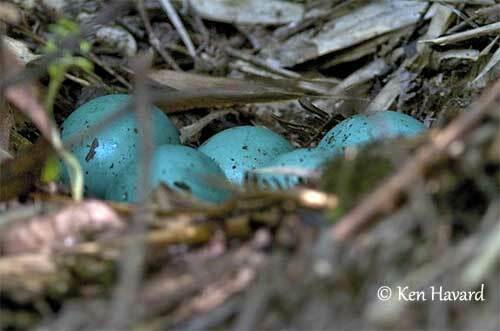 For numerous species, the nest is the place where displays and copulation occur. It plays a very important role during the nesting period. It is the cradle of the chicks, the place where the adults feed them prior to their first flight towards independence. This study begins with the birds laying directly on the ground. All these species are terrestrial and cannot fly or are clumsy in flight. For this reason, they nest on the ground. The Common Ostrich does not build a nest. The male prepares several unlined depressions in the ground, by scraping the sand within its territory. It chooses the nest-site and several females copulate with him. Rheas, emus (Emu) and cassowaries (Southern Cassowary) lay their eggs on the ground, in a shallow depression lined with some vegetation, usually grasses and leaves. The tinamous of family Tinamidae nest on the ground, often at base of tree trunk among the protruding roots. This is a shallow depression lined with leaves. 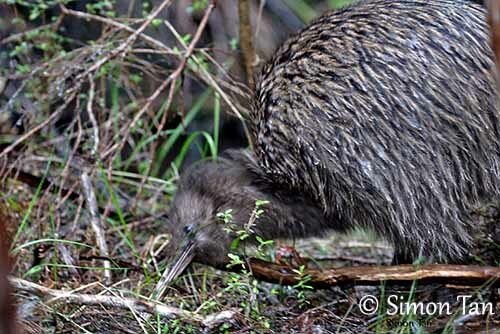 The kiwis of the Family Apterygidae nest in burrows excavated in steep banks, but they also use natural cavities, hollows in tree stumps or rock crevices. Usually, the burrow is excavated months or even years before being occupied. During this period, the vegetation is growing around the entrance which becomes well concealed. 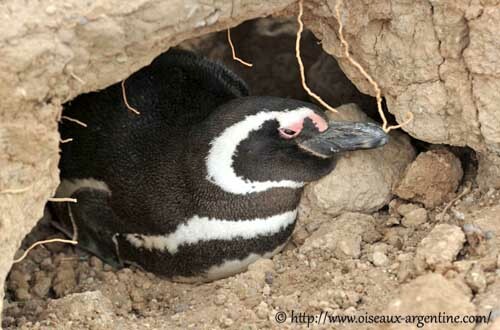 The other penguin species lay in a shallow scrape made with stones, twigs and available materials in the surroundings. They also use a scrape under bushes or boulders or a shallow depression with a rim made with rocks and mud. Some of them dig a burrow or nest in cavities, caves or rock crevice. All the nests are protected against sun and light by vegetation or rocks. The aquatic birds including loons or divers and grebes nest near water. They are good swimmers and fly very well. They are able to take-off from the water and to fly quickly and over long distances when they disperse or migrate. Aquatic species such as Gaviidae nest close to water. The nest-site is often within one metre from the shore, because loons or divers are very clumsy on land. But such location may involve the destruction of the nest by flooding, due to alterations of water levels. The nest is very simple, a pile of plant matter such as moss and aquatic weeds forming a shallow depression on the ground. The male brings most of material, and fresh materials are often added during the incubation by the incubating bird. The members of the family Podicipedidae (grebes) also nest close to or on the water. These species build a platform of aquatic plants, usually floating and anchored to the vegetation or built from aquatic weeds of the bottom of the lake. The following group includes very large seabirds, the albatrosses of Family Diomedeidae. These birds come to land only for nesting, and disperse widely after the breeding season. The nest is often used for several following years. The truncated cone is made with mud, grass and moss, with a shallow depression on top. According to the species and the location, the nest may be 15-90 centimetres high, often higher in wet places. 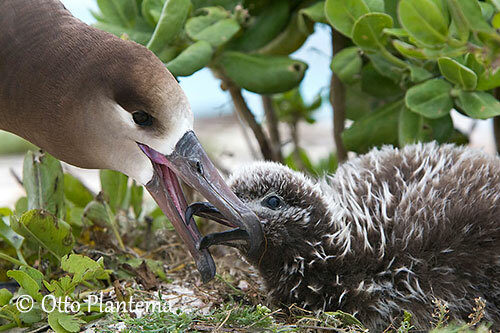 But the albatrosses of genus Phoebastria make more simple nests, often a scrape in the sand, with sometimes a rim formed by the accumulated nest materials. In contrast, the Waved Albatross does not build a nest and the egg is laid on the bare ground. 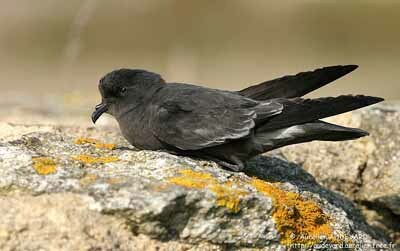 The Family Procellariidae is that of the tubenoses and includes petrels, prions, fulmars and shearwaters. They spend most of the year on the wing, they are clumsy on land owing to the rear positioning of their legs. 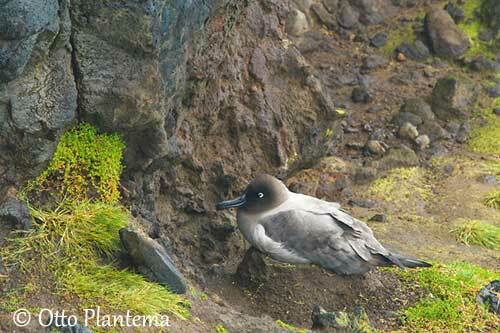 They breed in colonies established in steep rocky slopes, lava fields and cliffs or on offshore islets. They nest in self-excavated burrows, or in cavities, boulders and crevices, or hidden under dense vegetation. They are essentially nocturnal on land and visit the colonies only by night, in order to avoid predation. The colonies have usually a direct access to and from the sea, but in predator-free areas, they can be established several kilometres inland. 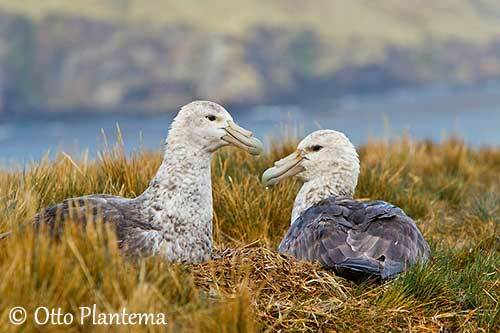 The Southern Giant Petrel nests in a low large cup made with grass, moss, small stones and bones. But sometimes, it is only a scratch in grass, sand or rocks. 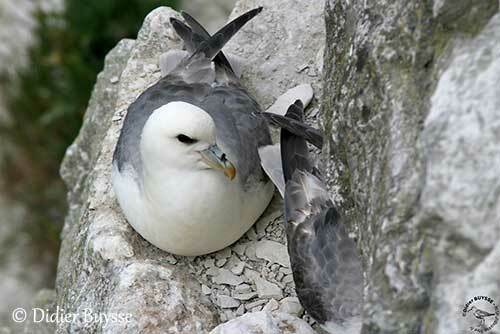 The fulmars nest in a scrape on rocks or pebbles, on narrow ledges in cliff faces or in hollows. 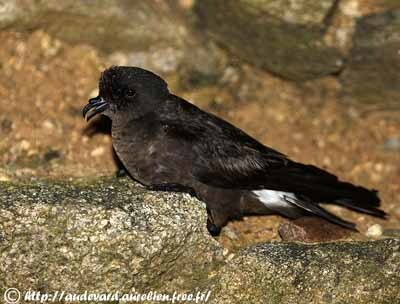 The storm petrels (Hydrobatidae) nest among broken rocks or in excavated burrows in soft soil and peat, or in cavities, rock crevice or in burrow under the low vegetation. The nest can be unlined, but sometimes, the nest-chamber is lined with feathers and moss. In soft soil, they may dig out the burrow with the bill and feet. They also may use abandoned burrows by other seabirds’ species or rabbits. 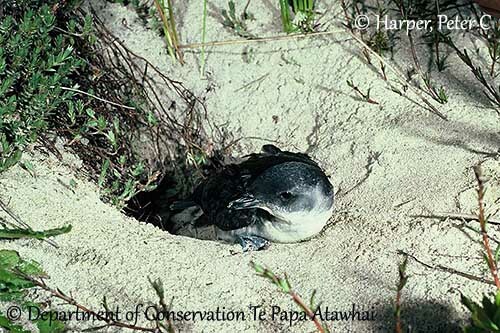 The diving-petrels (Pelecanoididae) breed in colonies and nest in burrows excavated in soft soil under rocks protected by dense tussock grass, or in rock crevices. The burrow is usually unlined, but sometimes, some feathers, grass or pebbles are added.